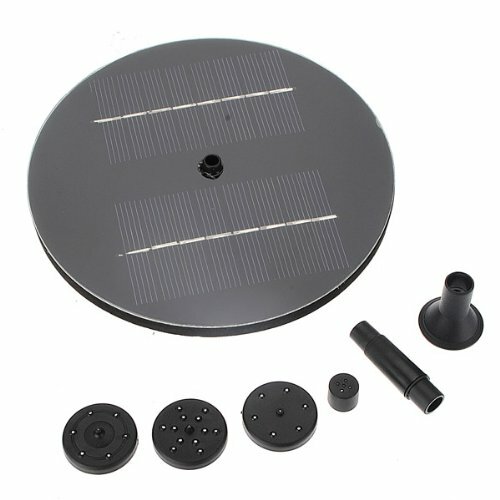 Solar Panel Water Floating Pump Fountain Pool Plants Watering Kit | Fountain City Art Ctr. Floating design, put it in the pool without any attachment. Does not need additional and external power supply. Decorates your garden if you have a pool or big aquarium. It will not work without sunshine. The best working time is from 9: 00am to 16: 00pm. The height of water is based on the strength of sunshine, it may not reach the theoretically height in spring or autumn. It is not a submergible pump; please do not put it on the bottom of your pool. Please place it horizontally to the water surface (it may take a few times to try). Make sure your pool is deep enough (30cm or more). Please do not let it run without placing it in pool. Remove the film on the solar panel before usage. for prolonged immersion in water. If you have any questions about this product by Yongse, contact us by completing and submitting the form below. If you are looking for a specif part number, please include it with your message.